SAVE $17.00 vs. Buying these items individually! Enjoy providing the indulgent feeling of a “SPA experience” at home when giving this SPA gift set! The products included in the gift set are some of PEAK 10 SKIN’s most popular items used in resort spas across the nation. It’s a gift of pure decadence. EYE SPA is a peptide | cucumber eye cream that will help to restore a healthier, energetic appearance to the eyes. BLACK DIAMOND restore + protect oil is a light luxury oil blend, perfect for your face, around the eyes, lips, cuticles or in your hair or even beards (for men). 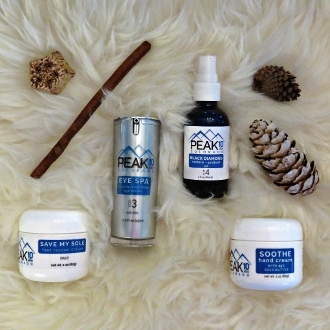 PEAK 10 SKIN’s rich and creamy SAVE MY SOLE foot rescue cream and SOOTHE hand cream contain 25% Shea Butter, known for its exceptional moisturizing and soothing benefits. With the cucumber extract in the eye cream, menthol and eucalyptus in the foot cream and grapefruit extract in the hand cream, you are certain to feel like you have slipped away to your favorite spa when using these products! Treat yourself or someone special to this soothing, relaxing gift!